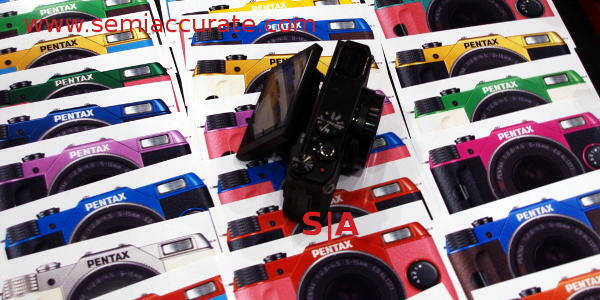 Pentax was showing off two new cameras at CES, a mid-range consumer part and a colorful SLR. Neither were game changers but the consumer focused MX-1 was rather nice and the Q10 can be nice if you have good taste. The MX-1 is a high end 12MP consumer camera with 4x optical zoom. It will do all of the expected things of a camera in this class including 1080p-30 movies and burst modes. What makes it stand out for me is two things, the LCD and the case. The LCD is about 1MP but it tilts and extends from the body making some odd shots a bit easier to line up. In addition, the top and bottom of body is made of brass so it feels solid and hefty. Pentax claims it will age nicely with the brass getting an antique patina with time. The parts you hold are rubberized so no worries there, and it all feels really good in your hand. The other camera is the Q10, a 12.4MP device without a mirror but with interchangeable lenses. It is halfway between an SLR and a consumer part like the MX-1, basically training wheels for a real camera. [Editor’s note: Maybe what Charlie needs?] Although the Q10 has been out for a while, a new feature is the color scheme, or the 100 color schemes you can get it in. You pick a body color and a grip color from ten choices, and wait a few weeks for your combo to be custom made. Choices range from classic black accents on a silver body to a rather putrid light pink body with light purple accents. Or the other way around. Or do the right thing and stick with a non-painful color scheme, the blue is quite nice.